…and that was the simplified map of the subway and rail system in downtown Tokyo. If you had looked at the map and thought to yourself “that’s all?”, good for you. If your jaw dropped or you started hyperventilating, hopefully this article would help calm you down. We will begin by exploring the train network before moving on to info on routing and passes. A disclaimer: I am not a train otaku so while I try to be technically correct with the use of every descriptive term, there may be small mistakes in usage of terms. Do let me know if there are errors. Also, we will also not discuss transportation from the airports in this post. For that purpose, read this article. This may be clear to some but not everyone is aware of the differences between railway trains and subway trains. For a lack of better word, I tend to describe railway trains as ‘surface’ trains. These are typically trains that cover a long route (even across prefectures) and are found on the ‘surface’. Most suburban areas are served by railway trains. For short distances, railways tend to be cheaper than subways. Subway trains, on the other hand, run underground. Well… in the case of Tokyo, most of the time (for example, the Marunouchi subway line runs on the surface for part of its journey). These train are mainly for commuting in and around the city center. In many countries and cities, the railway and subway systems are generally separate but in Tokyo, there is a little bit of confusion because subway trains sometimes carry on as railway trains at the end of their line. You can read more about this in point 3. Next, we need to distinguish between a line and a train company. A single train company may run multiple lines (or routes). For example, the Toei Subway company runs 4 train lines. Why the need for this distinction? Because you usually pay for tickets at a fix rate for trains of the same company (even if you switch lines), but have to pay more if you transfer to another company’s line. In other words, if you want to save money, if possible, stick to only switching trains between lines belonging to the same company. Not to mention that it is usually less troublesome (e.g. no need to exit gantries) to do so. JR East is the biggest passenger train company in the world and is also one of the more important companies if you are travelling by train in Tokyo. If you are on the JR Rail Pass, your trips on JR East lines are also covered. 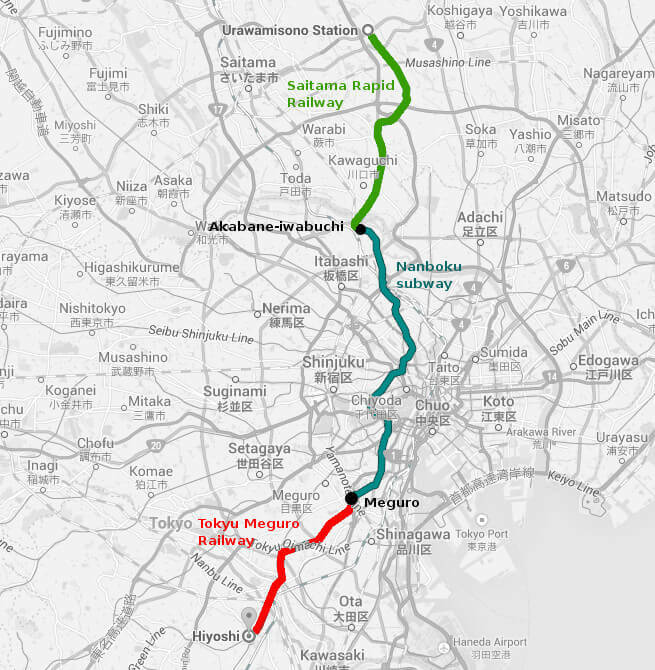 In particular, the Yamanote Line and the Chuo-Sobu Line are widely-used. The Yamanote Line is a circular line that makes stops at busy/popular areas such as Shinjuku, Shibuya, Shinagawa, Ikebukuro, Ueno, Akihabara and Tokyo. The Chuo-Sobu Line complements the Yamanote Line by cutting through the middle of the ring and extending from Mitaka to Chiba stations. 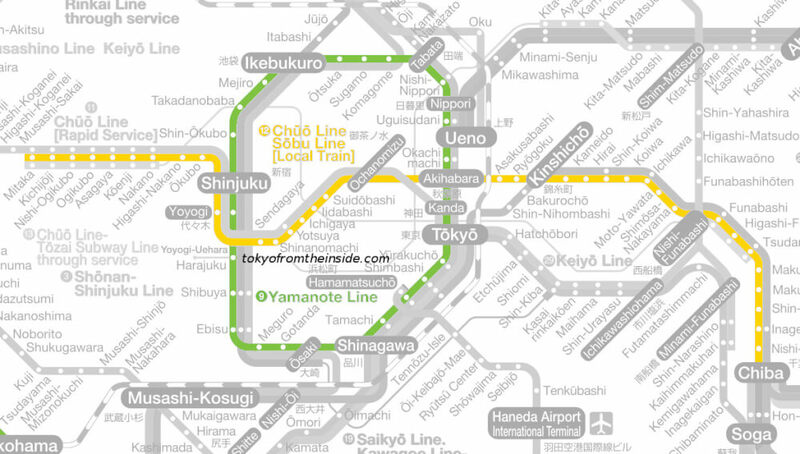 The Yamanote Line in green and the Chuo-Sobu Line in yellow. 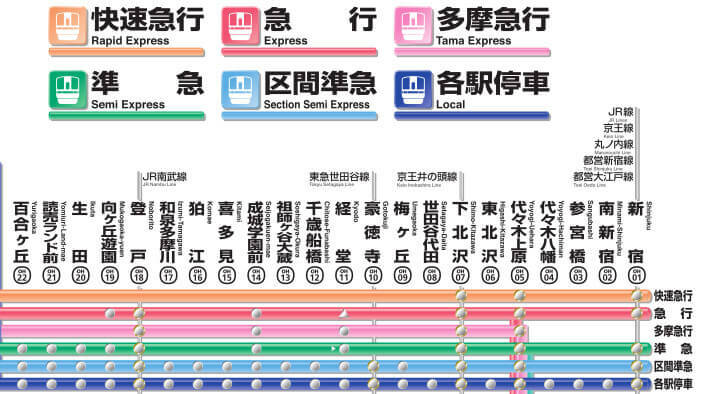 *Note that the Chuo Line has several services and the map above only shows the route for the Chuo-Sobu Line. Only Toei Subway lines are represented by vowels! Besides ‘S’, all other consonants belong to Tokyo Metro! 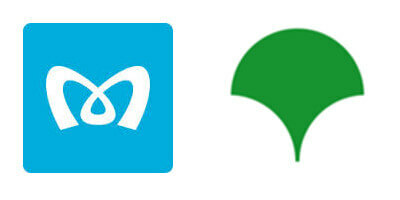 Left: Tokyo Metro logo. Right: Toei Subway logo. To be more precise, subway trains that carry on a “through service” as other railway lines after reaching their terminal. Or if you look at it from another point of view, suburban railway trains that temporarily become subways while running on the subway lines within the city. A useful thing to know because you can save precious time by waiting for the right train and traveling right through to the next line without transferring (there are sometimes transfer fees though). To pick the right train, you should look out for destination of trains (and hence deduce their route) on signboards in stations and on the trains themselves. Nanboku (N) line starts as the Saitama Rapid Railway Line until Akabane-Iwabuchi station. Once it reaches Meguro station, it becomes the Tokyu Meguro Line (bound for Hiyoshi station). Similarly, the Mita (I) line becomes the Tokyu Meguro Line once it reaches Meguro station. One can take a Saitama Rapid Railway train from Urawamisono station in Saitama Pref. and reach Hiyoshi station in Kanagawa Pref. as the Tokyu Meguro Line without leaving the train. The subway bit is between Akabane-iwabuchi and Meguro stations in Tokyo. Express services are faster by virtue of the fact that they skip stations. Hence, the fastest express services also service the least stations. Not unexpectedly, the stations that are skipped tend to be minor stations. Generally speaking, express services are more crucial for suburban railways and people using through services, as subway stations are seldom skipped. A few lines such as the Fukutoshin (F), Shinjuku (S), Asakusa (A) and Tozai (T) subway lines have express services that skip subway stations. Limited Express 特急 – tokkyuu Fastest for normal railway. May cost extra. *Do note that not all train lines will have all the above-listed express services and some train lines have their own custom express services like “Romance Car Limited Express”, “Tama Express” or “Rapid Rabbit”. This is especially the case for the Chuo Line which has a variety of rapid services. Using part of the Odakyu Line as an example (below), between Shinjuku and Noborito stations, the local train stops at every station (17 in total). The semi-express stops at 12 stations while the express service only stops 5 times. A typical schematic for express services. The lines represent different services and the nodes are the stations at which the respective services make a stop. Special seats are typically available for long-haul journeys such as shinkansen rides. Smoking carriages are sort of a thing of the past and the best that you can do is to have seat in the cabin with smoking compartments found on shinkansens. “Green cars” are the equivalent of first-class seating on trains and require the purchase of Green Car Tickets either using a machine or a ticket counter. “Reserved seating” means that you are given a fixed seat, and hence are assured of a seat. This almost always costs extra money.